The Lion King has Arrived! So we have Maleficent, Cinderella, and The Jungle Book movies which have all been revamped and the stories have been modified. In my opinion, 2 out of 3 were hits! Maleficent took me a few tries to appreciate (I really hated the fairies! ), but it was visually stunning as all the new movies have been. Yesterday, however, the Director of The Jungle Book (2016), John Favreau announced that he would be directing a new version of…. drum roll please…….. The movie is set to be released in 2019. It has also been confirmed that the new film will have some of the original songs in it. The Lion King is one of my all-time favorite movies, for sure. I’ve literally memorized more than half that movie word -for-word. To be honest, I’m not sure how this movie will be. It’s such a super classic and favorite that part of me is thinking, “Leave it alone!”. But another part of me is trying to imagine how freaking adorable baby Simba is going to be! Boy what a week this has been. What made it even harder to concentrate at my desk job was knowing that my wonderful parents are vacationing at Walt Disney World as we speak! #Jealous! It’s cool, though. They totally deserve time at the park and, seeing as I have been there multiple times without them, I really can’t complain (too much…). But maybe just knowing that they are in the happiest place on earth is causing me to daydream, and in my daydreaming I am flying around, up and over the magical park. So naturally, today’s Fun Fact relates to Up! Super cool, huh? 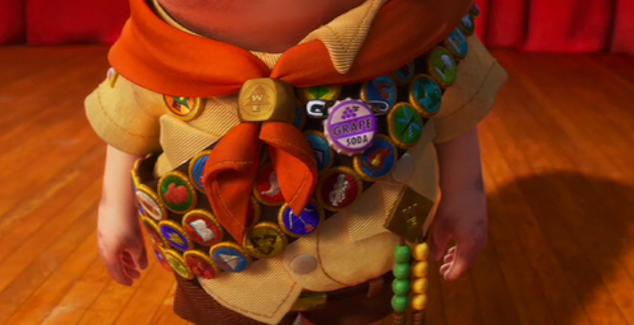 Those sneaky peeps at Pixar never miss an opportunity to add some hidden messaged in their movies! That’s what keeps them so interesting! Ok, time to be completely honest. Walt Disney World is my soul animal, yes, everything about it I love love love. But sadly, I am inherently petrified of most rides and have not attempted to ride such classics as Splash Mount, Space Mountain, or… you guessed it… the Tower of Terror. Does that make me any less of a Disney parks fan? No way! I’m grieving the loss of this iconic horror ride just like all the fanatics because it’s just that – an icon! The Tower of Terror is one of those rides that taunts you as you walk by, and it’s a lot of fun to watch the brave riders take the plunge, even from the safety of the ground below. And when you go to Disneyland, the ride pops out above the fences and you can see it from the street! Seriously. The ride has made an impression on me very strongly. Now, I really enjoyed the Guardians of the Galaxy movie, and I understand that it’s new and exciting and can agree that it should have a super cool ride in its honor. Although I don’t think the film deserves it more than some others (just saying), Disney is responding to something I’m sure, and today I can say confidentially that the good folks at Disney have no plans of changing there minds. That’s because on Monday, the infamous sign which reads “The Hollywood Tower Hotel” was removed from the front of the Tower of Terror building. You can read some of the initial responses here. So what do you think? Is the ride a favorite, must-do-every-time sort of ride for you? Are you a scaredy-cat like me who just happens to be ridiculously sentimental? Or, are you super-psyched for the new ride? Leave your thoughts in the comment box below! What’s in a Name?… Poll! If you’re like me, you’ve already planned out your future children’s names. And that includes human babies and fur babies. Of course, these names are all related to Disney, somehow. Luckily, I’ve already had the chance to use one of my favorite Disney-inspired names on my furbaby, Anabelle! Named for Belle from Beauty and the Beast, the ironic joke is that my quizzical pup can actually be both – a beauty, and a beast! As I inch towards my thirties (yikes! ), my mind is set more on future human children. And wouldn’t you know it, the folks at Disney Baby have already lent a helping hand and created a few categorized lists of Disney-inspired-baby-names. My favorite list is the 13 Retro Baby Names that I happened to stumble upon! 1. Walter – Walter has been popping up more frequently in my social media feed. It’s a timeless choice, as well as a great balance between sensible and creative. 2. Elias – Elias was Walt’s middle name, given to him by his father of the same name. It’s a Greek name full of religious meaning, and a more modern take on Elijah. 3. Arundel – Arendelle is the home to Anna and Elsa, so I shouldn’t have been so shocked to see a similar name show up in the Disney family tree. Arundel Disney was the great-grandfather of Walt Disney. This uncommon name could be shortened to Arun (like Aaron) for a boy. 4. Ollie – The iconic early animator Ollie Johnston was known as one of the “Nine Old Men,” the group of head animators responsible for movies such as Snow White and the Seven Dwarfs, Peter Pan, and Alice in Wonderland. He created Mr. Smee and Cinderella’s stepsisters. I love nicknames like Ollie that are given as full first names. 5. Mickey – Like Ollie, this nickname could totally be used as a first name. It’s iconic, it’s playful, and it’s where it all started. Mickey sounds like the kid on your T-Ball team, and when he grows up, Mickey sounds like the neighbor who always returns your tools in a timely manner. 6. Ozzie (short for Oswald) – Did you know Disney’s first animated star was Oswald the Lucky Rabbit? 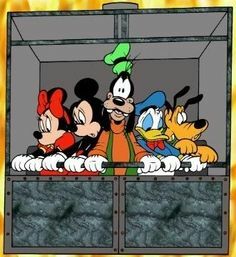 The precursor to Mickey, Oswald was funny and his cartoons had a great storyline. Ozzie is a fun choice for a family wanting to honor the legacy of Disney animation. 7. Peter – Said to have been Walt’s favorite, Peter Pan was released in 1953. Walt played Peter himself in a school play, having brother Roy hoist him by rope to fly. Peter has the charm of a youth who relies on faith, trust, and a little pixie dust. But it’s also a name to grow old with. 1. Lillian – The beloved wife of Walt, Lillian Disney also gave her name to one of the Disneyland train cars, the Lillie Belle Presidential Train Car. Like the elegant car, Lillian was polished and dignified. Lily is a more delicate version of the name, but still makes a great tribute to the First Lady of Disneyland. 2. Flora – Not just one of Sleeping Beauty’s fairy godmothers, Flora is the name of Walt Disney’s own mother. Flora would make for a name full of natural beauty. If you remember, it’s the gift of beauty that Flora bestows upon the infant princess in Sleeping Beauty. Since Flora also has access to the Sword of Truth and Shield of Virtue, naming a daughter Flora may just instill these attributes in her. 3. Marceline – I really love this name for a little girl. Marceline, Missouri is Walt’s boyhood hometown. Main Street, Disneyland was inspired by this small farm town. The name makes me think of sipping lemonade, baking pies, and making great childhood memories. Marcie or Celine would both be great nicknames for Marceline. 4. Georgina – As Walt watched his daughters upon a carousel, he envisioned a place where parents and children could have fun together. The King Arthur’s Carousel was one of the original rides when the park opened in 1955. Each carousel horse is unique, and named as such. Georgina is my favorite from the list (available at Disneyland’s City Hall). How cute would her first carousel ride on a horse with the same name be? 5. Alice – Alice Davis designed costumes for attractions like Pirates of the Caribbean. This legend was able to add Disney flair to her designs. Alice is also the title character in Walt’s 13th animated film. More recently, Alice has been seen as a powerful adventurer who believes in impossible things. Nothing is more Walt than thinking, “It’s kind of fun to do the impossible.” Looking for a name that’ll inspire wonder? Try Alice. 6. Mary – From quirky to classic, there’s something in Walt’s life for everyone. Mary Blair’s vibrant color scheme and modern style made her one of Walt’s most beloved and inspirational designers. Her iconic style is most clearly seen in the “it’s a small world” ride. If I had to choose one from each category, I’d have to go with Elias for the boy and Marceline for the girl. Moana Official Trailer is HERE! WOO HOO!!! I don’t have many words for this, honestly. I’m just so darn excited for this movie and I can barely contain myself! I am going to be there on opening day, with my 3D glasses on, and just allow myself to be immersed in this movie that is promising to be an instant classic! Check out the official Moana trailer from Walt Disney Animation Studios!